“Serenity” came into my life at an adoption event with the group I volunteer with, Angels of Animals, Inc. Her foster mom an inexperienced CH foster with a kill shelter was not able to care for her therefore she reached out to another rescue group also at adoption event. The foster mom brought her to the event asking for help, Serenity than known as “Opps” she was supposedly 14 weeks and only 1.5lbs and looked like she was barely alive, covered in feces and it was truly heartbreaking how she looked. I can cry even thinking about it. 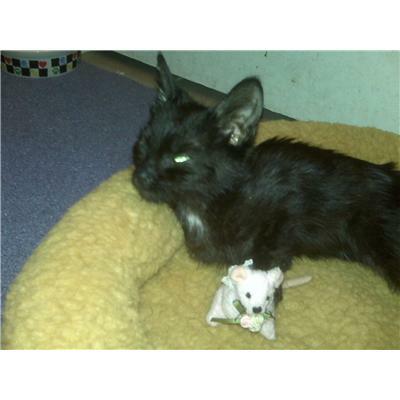 The other group, Here Kitty Kitty knowing our group works well with special need kitties sent her our way. After seeing her we could not turn her away, our president was away therefore I called her and told her the whole story. She stated we have no where to put her….I readily volunteered to take her in my bathroom. 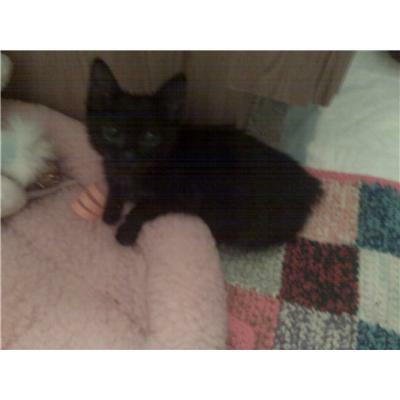 We took her to the vet and she was severely malnutrition and emaciated…. her blood levels were off, her sodium levels where high, her kidneys and liver were affected. We were really concerned and unsure if this little girl was going to make it. ….but with lots of TLC… her blood work normalized and she started to grow and began to thrive. This sweet angel was so thankful to be saved we developed quite a bond and I could not give her up. Already have to set of CH siblings; I decided what is one more!! Now at a little over a year old she is a little spunky girl…full of live and full of love. She is a little spitfire…when in play mode…she is CRAZY….but when she is in snuggle mode she is the best Snuggle Bug! I love this little girl to pieces and feel so honored to have been able to help her and give her a home!! Recent picture of the Little Princess! Starting to grow and look like a healthy kitten!